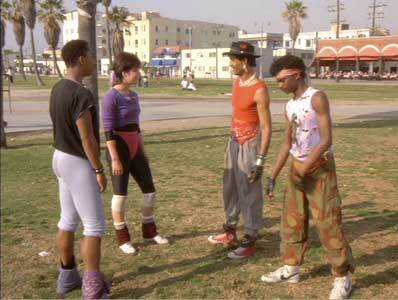 Adolfo “Shabba Doo” Quinones and others wears black, red, grey, and purple high top Converse “Chuck Taylor” All Stars in the film. Phineas introduces Kelly to Ozone and Turbo. Kelly (Lucinda Dickey) loves dancing. Even while she’s waiting tables she’s thinking about dancing. She takes dance classes, but the style of dancing just doesn’t engage her anymore. Also, the instructor Franco (Ben Lokey) is a creep who sexually assaults her one day. Her friend, Adam (Phineas Newborn III), whom she calls “Cupcake” teasingly, seeing that she’s despondent and takes her down to the boardwalk, where she witnesses the wonder that is breakdancing. 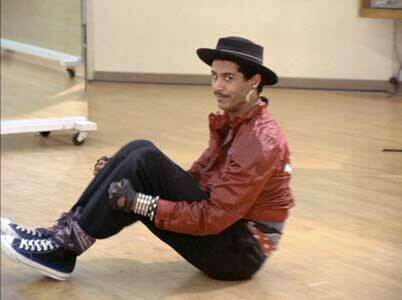 Ozone sitting on the floor of a dance studio. 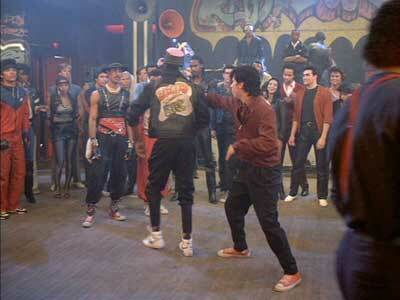 Kelly is introduced to Ozone (Adolfo “Shabba Doo” Quinones) and Turbo (Michael “Boogaloo Shrimp” Chambers). The three become fast friends. She loves their intensity, and how they dance just for the fun of it. They even give her a street name, Special K. After, Kelly gets a manager, James (Christopher McDonald, from Happy Gilmore), and begins auditioning as a dancer, but after one day is tired of it. Meanwhile, Ozone and Turbo get served by a group called Electro-Rock (Bruno “Pop n’ Taco” Falcon and Timothy “Poppin’ Pete” Salmon) when they introduce a third member (Ana “Lollipop” Sanchez). How do you dance against that?! Humiliated by their public defeat, Ozone also becomes despondent. Kelly suggests that all anyone noticed was the girl, not their dancing, and volunteers to help out. Turbo is reluctant, but together they teach Kelly how to pop n’ lock like a pro! The new trio, soon to be called TKO Crew, ably takes down Electro-Rock, and James is impressed by the dance style of these street youths. 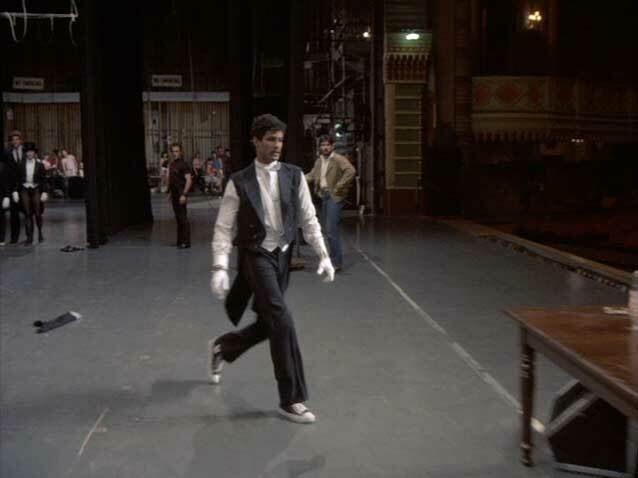 Prior, he had told Kelly, “Street dancing won’t get you to Broadway!” He tries to get them in shows and introduces them to important high society people, but Franco, who is a bitter snob, stands in their way. Prideful Ozone, meanwhile, resents being trotted about like a show horse when all he really wants is to be closer to Kelly. Partly, Ozone is also afraid that he might fail. Ozone is challenged by Electro-Rock. It all comes down to a competition, which is really an audition for a new musical show that’s looking for jazz dancers. Franco uses his pull to lock the audition and keep TKO Crew from competing. James argues with the head judge of the panel, the stuffiest old English person you could imagine, but the old man won’t have it. Frustrated by being told what he can’t do and his fear of success, Ozone brings it and in seconds TKO Crew has wowed the panel. Even if they don’t get to be dancers in a big show, they’ve proven they have what it takes. They do get the show, however, a gaudy, awful looking production called “Street Jazz”, which is really more like a music video. So, in the end, they do make it big. Fun fact: This is the big screen debut of Ice-T. And, if you look during the first boardwalk scene, you can see a young, uncredited Jean Claude Van Damme as an extra dancing along goofily in the immediate background while wearing a black singlet. Ozone and Bruno are putting moves on each other. 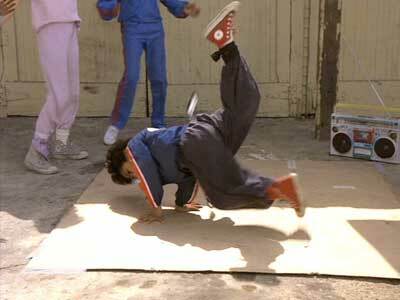 Breakin’ is pure cheesy fun. Yes, it’s a bundle of the simplest, cliches imaginably. It’s hokey-malokey. The cast are all dancers first, so their acting isn’t great. Dickey is dispassionate, and Quinones and Chambers are obvious amateurs. But they’re all very appealing. We like their personalities and when they’re dancing they own the show, even if the dancing might look absurdly dated and silly today. The music is perfect. Ultimately, it’s elevated by its uniquely 80s awesomeness. And then there’s the classic scene where Turbo does his famous broom dance in front of a grocery to Kraftwerk. It’s transcendent! The only thing I didn’t like was that the film is about a group out to show the legitimacy of their dancing, specifically by winning this contest, but it’s already legitimate because it’s in a movie, the one we’re watching right now. And not only is it a box office hit, it’s already promising a sequel (the lesser but famously titled Breakin’ 2: Electric Boogaloo). But that’s just my mind overworking. 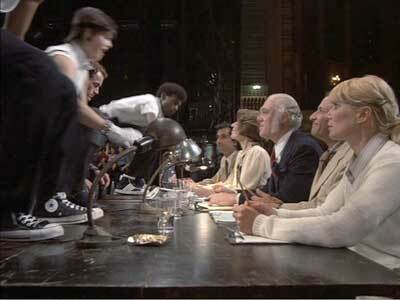 TKO stands up to the judging panel, literally. Young kid showing off his moves. 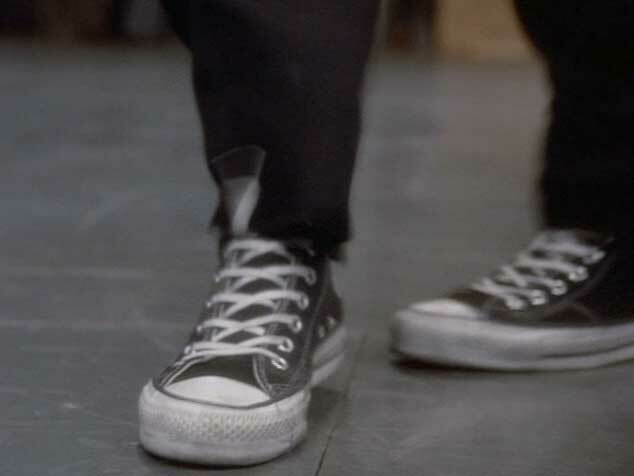 Throughout the film, Ozone wears several shades of chucks. Dancing on boardwalk, he wears red chucks. Practicing at home, he wears purple chucks. 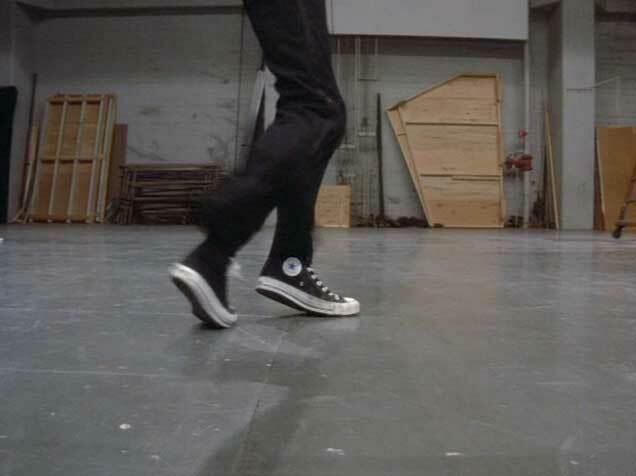 And, at the big competition/audition, he wears black chucks with his tear-away tuxedo. 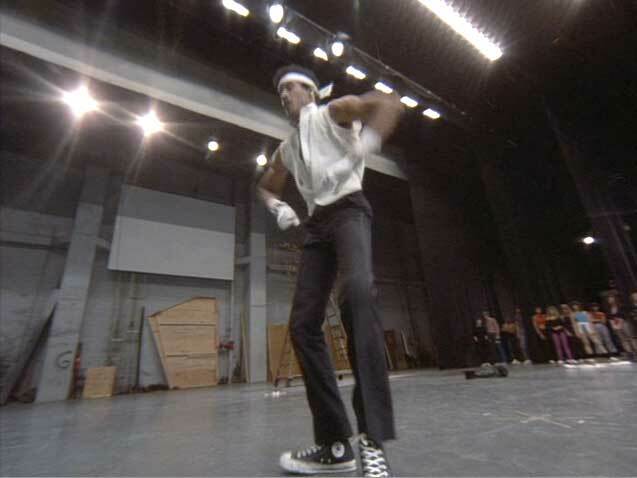 Other dancers throughout the film also wear chucks. 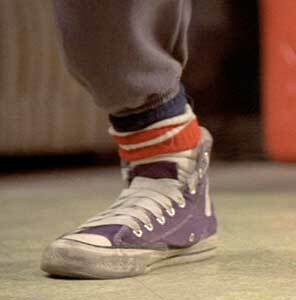 In a scene where Turbo is teaching some kids how to dance, one girl is wearing gray high top chucks and one adorable little kid is wearing red chucks. 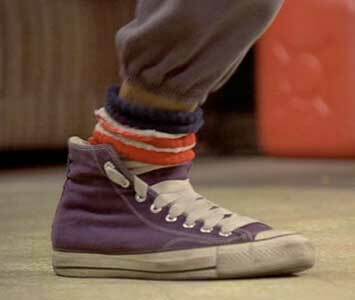 Images 1-4: Close ups of Ozone dancing in his purple high tops. 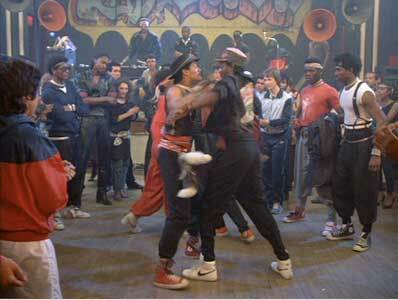 Images 5-14: Shots of Ozone during TKO Crew’s incredible dance sequence. 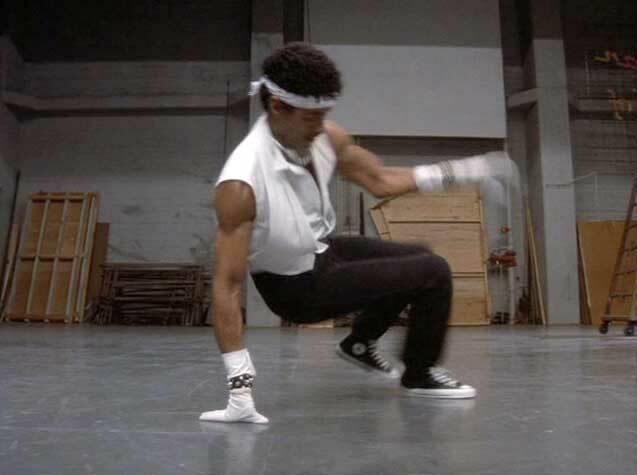 Breakin’. (1984) Lucinda Dickey, Adolfo Quinones, Michael Chambers, Ben Lokey, Christopher McDonald, Phineas Newborn III, Bruno Falcon, Timothy Solomon, Ana Sánchez, Ice-T. Directed by Joel Silberg. Categories: Drama, Musical. 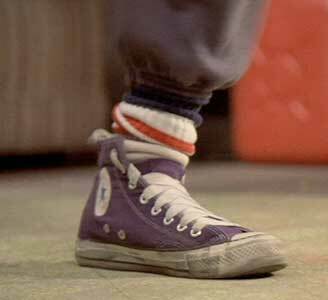 ChucksConnection Rating: 2.5 chucks for the film + another .5 chuck for the numerous great shots of black, red, and purple high tops.